Zippo Lighter How It's Wrapped Ad 1956 This is a June 11, 1956 advertisement It is a nice color ad from Zippo Mfg. Co. of Bradford, Pa. Pictures a young girl (about 10) and a young boy (about 8) at a coffee table. Girls is holding a package that is wrapped pretty fair and the little boy is struggling to wrap his package and the girl is saying, Dad won't care how it's wrapped...It's a Zippo. Picture by Dreyers (not sure of spelling) In mint condition. Photo is taken through plastic and may show wrinkles or crookedness that is not in the ad. This magazine tear sheet measures 9 3/4"" wide by 13"" tall. 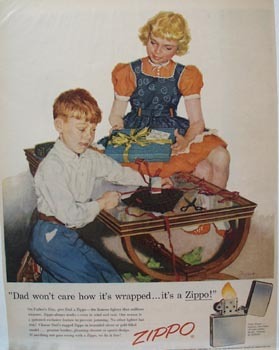 Items Similar To "Zippo Lighter How It's Wrapped Ad 1956"